I used to be a person who thought cats were basically benign creatures. Sure they sometimes got underfoot and a person with a more cynical mind might want to believe they were trying to trip us intentionally. Not me. I figured they were just either very poor leaders or very poor followers, this penchant for being right where your foot was supposed to land. Now I am not so sure. It started with a change in eating habits. For the eight years of our life with the fantastic four, our rescues from two consecutive litters by the same feral female, we were treated to the satisfying sight of four kitty heads in their food bowls happily munching away at the kibble we provided. Twice a day, even three times a day if we were in a 'feed the kitties' mood we could lay down the grub and there they would be, like hogs to the trough, eating whatever amount we put down. They were bottomless pits and their little swinging bellies showed the evidence of their hard work as eaters. It was their one job and they had a remarkable work ethic. They couldn't have eaten with any greater gusto if they had weekly meetings and a mission statement. Those cats were the best at eating kibble. Were we concerned about the calories consumed? Well, yes, a little. Our four cats come in different sizes with the male being a full sized econoline van, one female a four door sedan, another a two-seater sports car, and the final one a tiny mini-cooper. The two larger cats were 'big boned' so they could carry the extra fat well, looking robust and swarthy, and yes, admittedly sporting droopy hanging beer bellies – but they handled it well. The sports car version of our cats was lean, mean, and carried not an ounce of excess flesh. She would never be fat no matter how much she ate and we should all be envious of her incredible metabolism. The little one was only half the size of a regular cat, but full sized in her appetite. She could throw down with the rest of them and if anyone left anything in a bowl she would vacuum that up as well. She attained the plush toy status in her body composition. Every part of her was soft and spongy just like a stuffed animal. You knew she had to have bones somewhere but they were incredibly insulated. Her belly undulated beneath her and not too far away from the floor either, what with her being so small to begin with. I called her my little football and she was just about as wide as she was long. Yes, we were a bit concerned about all the cat fat. That is what made us forgo the mid-day feeding and institute portion control as best we could. Given the variation in size we had to choose what we felt was appropriate for the big guns and hope the micro cat would at least slim down a little. We had good success and although they were still fat, micro-cat's belly was further away from the floor. This regime went on for quite a while and we were all blissfully happy with the arrangement. The something happened. Our happy eaters, our dedicated consumers stopped eating the kibble. Purina One. No longer only chicken. A sure sign of corporate cruelty. We had been purchasing what we felt was reasonable quality cat food. Purina brand was our chosen preference although sometimes we changed to other brands. It didn't seem to matter although when we first opened a new bag they chowed down with even more gusto to our seasoned eyes. 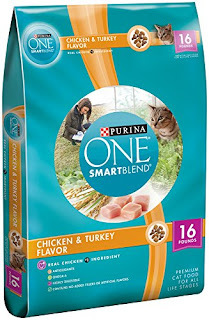 We decided to upgrade to Purina One because its first ingredient was chicken. 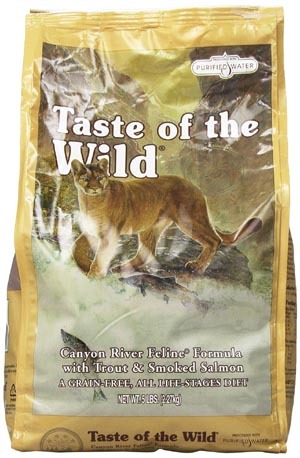 We were doing our best to draw that fine line between high quality cat food and financial ruin. Our good eaters were polishing off a twenty pound bag of cat food with alarming regularity. The cats loved the Purina One and showed the kind of enthusiasm better suited for farm animals. Then Purina changed the chicken formula to include turkey. Now just a word here about turkey and these cats. The only time we ever had a breakdown of the cat consumption ethic was that one time I thought to bring down the kitty fat with a change to the leaner turkey formula cat food. They let us know on no uncertain terms that we had replaced their succulent repast with what amounted to garbage. Oh, they still ate it mind you, but with resentful looks and lots of leaving it in the bowl until the ants got it. Lucky for me I had chosen a small bag so we were able to get back to the 'real' food quickly and all was forgiven. Learning point for me: these cats hate turkey. Gotcha. 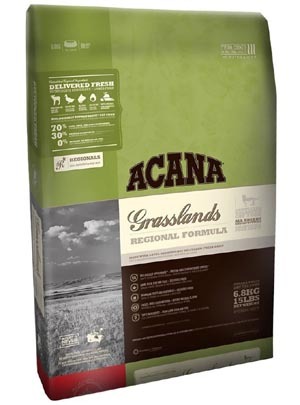 So, why did Purina change the formula? We went from happily buying 22 pound bags to empty shelves. In desperation we chose another brand that had chicken as the main ingredient. A little more pricey, but okay, we could tighten our belts a little for them. They started off eating it like this was the new ambrosia, but within a day or two we were getting the food left in bowl and angry, hungry cat routine. Taste of the Wild Tried and rejected. with the cougar or something. This went on and I tried another brand. Even worse results. We were in the habit of keeping their food in a large airtight container that could hold a full 22 pound bag. I was buying smaller bags to try out and if they ate it, pouring that bag into the container. Eventually the container resembled some sort of sand art project with different kibble at various layers. Purina started appearing on the shelves again, but the new chicken flavor also contained turkey. Damn their evil hearts. I nearly had a breakdown in the pet isle when confronted with that ingredient label. I got really desperate and began buying small bags of increasingly expensive cat food. These too were rejected. Then we had a health crisis. One of the most unfortunate things about keeping cats outside is the potential for infectious diseases. We live in a neighborhood of feral cats. 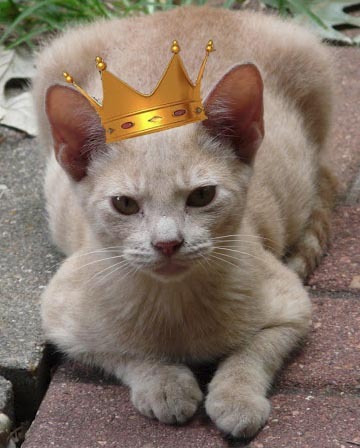 Aside from our four, there are probably no other cats in the neighborhood that have been neutered or have had shots. There is a constant influx of cats from all the fecund felines around here. Such a high cat population density allows illness to spread. Although luckily we don't seem to have the scourge of feline leukemia, we do have a feline herpes virus in the neighborhood. I had never heard of this before it afflicted our cats. The vet told me all about it when I brought in one of our elderly cat who had all these sores in his mouth. These are the equivalent to cold sores and make life very uncomfortable for the afflicted. There is no cure and the only treatment is supportive. Keep them eating my vet told me. Give them lots of reassurance and they will get over it. Expect a return if the cat gets stressed. It turns out that the kibble fiasco was stressing out my cats and the big guy couldn't find his zen place. He developed a very distressing outbreak. Overnight he went from eating steadily if somewhat reluctantly the various kibbles we tried to hissing at the cat bowl after the first mouthful. At first I thought that this was just his 'opinion' of the kibble, but it became obvious there was something wrong. Wellness Brand. Expensive gooshy food. Thus we tried 'gooshy food' therapy. Usually we only give canned cat food as occasional treats. We reserve it for special times so it remains special. Feeding kibble is much preferred because kibble does not leave a nasty residue in a bowl. Such residue attracts ants and roaches faster than we can pick up the bowls. We also know that wet food is even more of a dice throw than kibble. More times than not there will be a half-hearted consumption and sometimes there will be complete rejection of whatever canned fare we offer. Thus we have languishing on our shelves can after can of initially accepted but on the second try rejected canned cat food. We knew enough not to offer them turkey, but we also learned that pate was the only way and this shredded stuff – well you might as well just open the can and pour it directly into the garbage because no cat in their right mind was going to eat that stuff. For our sick big guy we brought out the cans. He would take a bite, then suddenly hiss or scream and run out of the porch. We were desperate, all of us. He was hungry but now fearful of even the bowls we put the food into. We would coax him to the food and the same scenario would repeat itself. He began to lose weight. The only thing he could tolerate was the water from our water packed tuna. We would bring him in three times a day and give him that but since there was little calorie content his weight was still plummeting. 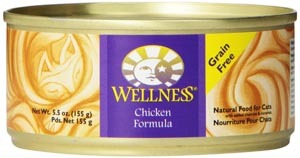 I scoured the shelves for what might be tolerated and came up with an organic chicken pate that cost over $2 a can. If I mixed it with water until it was totally liquid he could tolerate it. First he drank what amounted to a quarter can. If he drained the liquid and tried to eat any of the residue he would end up hissing and crying. So, as soon as he had drunk the liquid I would pick up the bowl and add more water and stir to recreate the special kitty sauce. Over the course of 30 minutes or more we would go through this routine so he could consume about a half of a can. Eventually he was able to down an entire can in this way. It seems that his penchant for eating large amounts of kibble actually saved him since it allowed him to consume two cups of liquid at a meal without overstretching his tummy. He still lost weight but thankfully he had a lot of fat to go through. After several weeks he was doing better. His weight was actually much more appropriate for his size, but I worried that if he were to go through another episode that he would be in danger. We fed him as much wet food as he would eat, which was about two cans a day. He would also eat some kibble, but it had to be very small sized. I found a very expensive tiny sized kibble that he would consume. Meanwhile his sisters were still in full kibble revolt. I would find a kibble they seemed to like and then a week later that kibble would have run its course and they would eat a mouthful or two and leave the rest. They were bringing me to my knees. Each week I would scour the shelves for something new to try. The feed store had several varieties, but I was daunted by the extreme price. Cat kibble is a money making opportunity if there ever was one. Some of the kibble costs 7 to 10 dollars per pound or more. I balked at feeding my cats what would amount to the equivalent of prime cuts of beef or lobster when I don't allow that kind of expense for my own food. I especially balked at buying the expensive kibble only to have to throw it in the garbage when they rejected it. I started to spike all the cats food with tuna juice. This worked for a while but neither my husband nor I could eat enough tuna to provide all the juice we needed. Then I found a special kitty tuna. The can even said it was line caught – oh joy – no social stigma of net caught tuna for my kitties. This brought exactly two weeks of peace. All the cats got some canned tuna on their kibble. The kibble was being eaten and even our big guy was back to eating almost normal. It didn't last. The big guy started just drinking the liquid from his bowl and then rejecting everything else. The girls were still mostly eating their food, but his bowl would remain. He started losing weight again. We have now gone into canned food variety mode. I no longer even look at the cat food prices and just accept that I am working primarily to feed my cats. He is eating again but only if we bring him into the kitchen and add some liquid to his wet food and feed him in his special bowl. He gets the kitchen to himself because while he is eating we keep the dogs outside. The dogs are not happy about this arrangement at all. There doesn't seem to be anything wrong with his mouth. Last night after he polished off his can (half a can at first then when he is done with that you can put the other half can in – he won't eat it if you put the whole can in at once – no, I don't know why) he joined me on my bed where I was lying exhausted from all the care taking he needs. I was petting him and giving him that emotional support the vet says he needs during these tough times. He thought that was nice but he then thought what would be nicer was if he could just bite me. Bite me and hold my hand roughly in all his claws and kick me a little too. Bite me and rub his mouth on me so that I could tell there is nothing wrong – no kitty cold sores. Haven't tried it yet, but no doubt, soon to be rejected. Tomorrow I will be searching for more varieties of expensive canned cat food for his highness and we will begin buying smaller and smaller bags of expensive kibble to try and keep them eating. He is a tyrant. The are all tyrants. I have been defeated and to the victor goes the spoils.